Once again, TerraNova has joined forces with the National Breast Cancer Foundation for Breast Cancer Awareness Month (October 1-31), and their Pamper with a Purpose campaign is definitely worth you attention and participation. TerraNova®, purveyors of premium perfume, bath and body care since 1970, announced today that they will be joining forces to fight breast cancer with National Breast Cancer Foundation, Inc.® (NBCF) during Breast Cancer Awareness Month (October 1st-31st) for the second consecutive year. Customers that visit and purchase pink TerraNova® Tuberose or White Ginger Collection products or Limited Edition "Pamper with A Purpose" gift sets online ...during the month of October, will have the opportunity to save 5% and, also, have 5% of their purchase donated to NBCF. Proceeds will help NBCF continue their mission of Helping Women Now® by providing help and inspiring hope to those affected by breast cancer through early detection, education, and support services. "As a woman founded and owned company, Terranova® considers the fight against breast cancer a cause that is very close to our hearts as we have all been touched in some way by breast cancer whether it be through friends, relatives, or co-workers," said Ann Saunders, President of Terranova®. "By partnering with highly reputable organizations, like NBCF, Terranova® is able to contribute to early detection programs that will help women across the country in the battle against breast cancer." 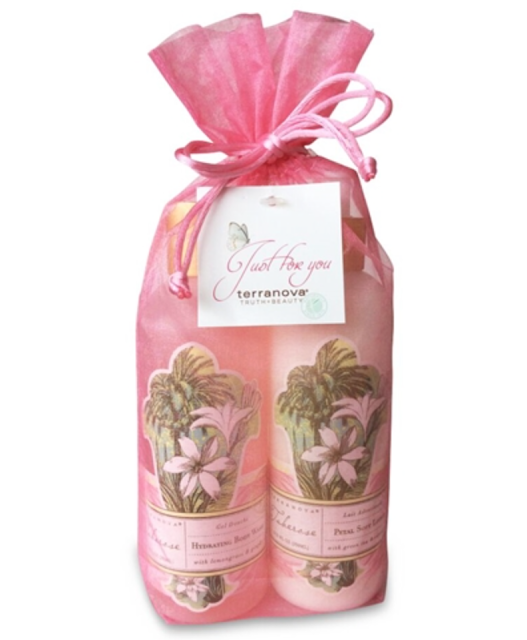 Pamper with a Purpose Duo ($32.50 from TerraNova): includes full size bottles of Tuberose Hydrating Body Wash (8.25 oz.) and Tuberose Petal Soft Lotion (8.25 oz.). Pamper yourself or someone you love with Terranova Tuberose scented luxuries while helping the fight against breast cancer! Our limited edition "Pamper with a Purpose" Gift Set includes a 8.25 oz bottle of Tuberose Hydrating Body Wash and a 8.25 oz bottle of Tuberose Petal Soft Lotion, enclosed in a pink organza gift back, and "Just for You" gift card. Tuberose Hydrating Body Wash is a delightful body wash with the intoxicatingly beautiful scent features Tuberose, Lemongrass, Ginko, Lotus and Green Tea. The lovely commingling of these notes results in a fresh floral that delights the senses. Skin is left soft and silky smooth, and never stripped. The foaming gel not only does an amazing job cleaning the skin, but it also does an exemplary job as a shaving gel. A silky smooth, luxuriously foaming gel cleanser infused with the sensual scent of Tuberose, plus renewing tropical botanicals -- lemongrass, ginkgo, lotus and green tea. Skin will be perfectly cleansed feeling soft without any messy residue. Pour a cap-full under running water in the tub for a billowy bubble bath or apply directly on skin in the shower with our natural agave wash cloth or invigorating mesh body sponge. 8.5 fl oz bottle with convenient flip-top dispensing cap. Paraben and phthalate free. Follow up your bath or shower experience with our Petal Soft Tuberose Body Lotion for lasting hydration and fragrance all day long! Ingredients: Water, Sodium Myreth Sulfate,Sodium Lauryl Sulfate, Lauramine Oxide, Cocamide Dipa, Fragrance, Camellia Oleifera (Green Tea)*, Hibiscus Sabdariffa Flower*, Hibiscus Rosa-Sinensis,Cymbopogon Schoenanthus (Lemongrass), Ginkgo Biloba, Lotus Corniculatus Flower, Paeonia Albiflora (Peony) Flower Extracts;Citric Acid, Polyquaternium-7, Sodium Chloride, Dmdm Hydantoin, Aloe Barbadensis Leaf Juice*, Glycerin, Betaglucan, Red 33. *Certified Organic Ingredients. Tuberose Petal Soft Lotion is a lightweight and fast absorbing antioxidant-rich body lotion that leaves skin scrumptiously hydrated, silky smooth and supple. Like the body wash, the intoxicatingly beautiful scent is punctuated by Tuberose, Lemongrass, Ginko, Lotus and Green Tea. The light aromatic veil sits close to the skin, and fades after a few hours, but that can easily be remedied by reapplication! A luxury hand and body lotion to moisturize and smooth with anti-oxidants, vitamin E, green tea, hibiscus and peony. Glides on effortlessly to leave a delicate misting of Tuberose fragrance, and reveal soft, resilient skin. Love the comfort of your skin! Paraben and phthalate free! Ingredients: Water, Cocos Nucifera (Coconut) Oil, Emulsifying Wax, Fragrance, Cetyl Alcohol, Potassium Stearate, Aloe Barbadensis Leaf Juice*, Camellia Oleifera (Green Tea), Hibiscus Rosa-Sinensis, Paeonia Albiflora (Peony) Flower, Lotus Corniculatus Flower, Cymbopogon Schoenanthus (Lemongrass) & Ginkgo Biloba Extracts; Mangifera Indica (Mango) Seed Butter, Phenoxyethanol, Dimethicone, Potassium Carbomer, Caprylyl Glycol, Ethylhexylglycerin, Sorbic Acid, Retinyl (Vitamin A) Palmitate, Tocopherol. *Certified Organic Ingredient. Since its inception 45 years ago by visionary Jane Saunders, Terranova® (meaning 'new earth') has remained committed to their mission of "Truth and Beauty" by creating products with fresh, clean fragrances and healthy, natural ingredients. Overall Assessment: Amazing quality duo, and to say that this is a worthy purchase for a worthy cause would be quite an understatement! It is a delightful scent, and the cause is just so important! 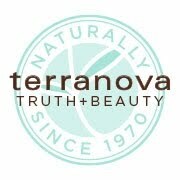 Yes, I have written about TerraNova several times, and I really love their products! Love a great cause attached to body care! The petal-soft lotion sounds ideal for all-over moisturising during the warmer months. It is a fantastic lotion! Beautiful bottles. This would make a wonderful and meaningful hostess gift. Everyone wants to support breast cancer. The bottles definitely are gorgeous, and the cause it so important! This really would make a perfect hostess gift! These sound really nice and I'm all for brands giving back! They are fantastic, and I completely agree with you about brands giving back! This is such an important cause, too! These sound lovely and I do like that old school vintage look to the packaging, reminds me of some products my mom used to buy for me as kid. They really are wonderful, Honey! That's so cool that they remind you of your childhood! The Tuberose scent sounds amazing and I love when companies do good! The scent is divine, and I agree with you completely! This is such an important and worthy cause!